Just say: "half order carne asada nachos" and for $4.68, you get the quintessential fuel for all-nighters, food for the nocturnal munchies, the harbinger of heart-burns, the anti-Lipitor, and my favorite item at Alerto's, a Mexican food pit-stop famous for enormous burritos stuffed with nothing but meat. There are two Alerto's outposts on Brookhurst Street, and although they are a few blocks from each other, each are technically in different cities. One is in Fountain Valley, while the other, Westminster. The Westminster branch is cleaner, more consistent, with a dining room that's open until 12:30 a.m. on most nights and a drive-thru that never closes. But at either one, when ordering the nachos, always specify "Half Order", because since the quantity served is the same, the only difference between the full order and the half is two bucks. The first bite is always the best, simply because guilt hasn't set in. You revel in the hearty corn crunch of real tortilla chips; the pleasant mushiness of refried beans; the chewy/tender morsels of seasoned steak; the slobbery green goo of the guacamole; the tang of cheese; the coolness of sour cream; and the oniony bite of the pico de gallo. It all makes sense and feels so right, especially when it's way past your bedtime. Remorse always follows the last chip, not because of all the fat and calories, but because you want another one. I'll have to try the Westminster one sometime. The FV one needs a little work done on it by a wrecking ball. It's just dumpy and not even in a quaint, charming way. One time the food I got at it was so bad I had to throw it away. I vowed never to go back but went one more time with a group who really wanted to go there. All I remember was that the food at least seemed acceptable. Whenever people ask my opinion on Alerto's (and I do get asked for it) I have to say, "I had a really bad experience there one time that probably keeps me from having an accurate opinion on it." Hey Elmo - We always drive past Alerto's on the way to the freeway when we're in the area. 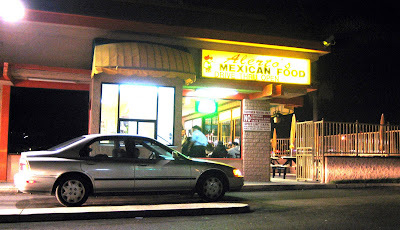 Have always wondered about the place..especially since the name is like one of those "something - 'Berto's" taco shops we have in SD. I got heartburn just reading that! Ha! I think I would even have to share the half portion. That, or spread it out over two meals. That could work. What's with the shorter reviews??? Spoil us with your prose! The Carne Asada fries are pretty guilty delicious too. When ordering the Carne Asada chips to take home, I'll ask them to put the chips separate so that they aren't soggy by the time I get home. I'm still in the holiday spirit of the Lunar New Year, so I don't feel guilty if I ate this right now. Bring it on! I second the french fries. Just reading this description gave me hunger pains. I think nachos are in order considering I have 24 corn tortillas that need to be used up ASAP. I love your post and I love Alerto's. Have you ever tried their carne asada fries? It's basically the nachos but with delicious french fries instead. I can't help but stop by this place and order a chorizo burrito (Mexican chorizo and eggs, a wonderful breakfast) and their fries. I was feeling bad enough about myself for eating that foot-long meatball sandwich at lunch, but this post actually managed to make me feel even guiltier. I feel as if I ate those nachos myself with your exceptionally descriptive post. Yum. Again, I say, "Yum." Well, except for the guacamole since I have an allergy to avocados, but otherwise, you made me hungry with this. The one in FV can really be bad. Once I had the nachos there and the chips were limp with fry oil. But other times it was great as always. We don't gamble anymore with that branch and always go to the Westminster outpost up Brookhurst. It's worth the extra two miles. The "Insert-Your-Name"+Berto places seems to dot the landscape. I only trust Alerto's though. But when I see "Elmoberto's", I'm totally stopping in, I don't care. Truth be told, I *always* share the nachos. It's the only way I know to enforce portion control on myself. Man, I didn't think anyone would notice that I've been kinda "phoning it in," especially this one, since I was out of town all of last week (Alerto's nachos was the meal I had when I got back late from the airport). Thanks for paying attention! I've seen those carne asada fries. They do indeed look great. But eventhough nachos aren't even truly Mexican (invented in 1943 by someone named Ignacio, for a group of U.S. military wives), I can't pry myself from the crunch of a good tortilla chip. Would you be surprised if I told you I had these nachos twice in one weekend? Yep, I did. I admit it. Oh absolutely. This is one junk food that can be easily made at home. Seasoned taco meat (ground beef) would do just as well if you don't have carne asada. OK, that's three people with a thumbs up vote for the fries. I may have to try it then. I love those chorizo burritos too. Wonderful breakfast...but a heavy breakfast. I ate half of one once before work and fell into a food coma almost immediately. I think the way I mitigate my guilt is to share it with you! This way, I can tell myself, I am eating this fat-ladened, calorie-packed meal for the good of my blog and those who read it, and maybe have those readers share in the guilt. Mission accomplished! I made myself a cheese crisp from "The Home Cook's" directions, but I gotta tell you, as good as it was, I still need to try a true Arizonan cheese crisp. Haha, that photo is begging for some vaguely look-alike person to co-star in a Vytorin commercial - but looks and sounds so delish and such perfect munchies food. Silly Elmo. Fifty pushups only offsets the first bite. Alertos nee Alejandros kept me going during those coding all-nighters for ICS classes. Those were the days. Elmo - I just found your site today, it's awesome I'll be checking out your reccomendations for sure. I've been looking for some really good nachos and this place is near my house, I'll be trying it this weekend. Hmm I've never tried their nachos. I've always gotten the fish burrito, the breakfast burrito, abadoba(?) burrito and sometimes taquitos. I'll have to pay a visit soon! I love those Vytorin commercials. But I'm afraid the only person who would resemble a pile of these nachos would be Jabba the Hutt. Ah the fond memories, when we threw caution to the wind and built up bad eating habits that we're still paying for now! Hehehe. Yup. They really should have a defibrillator next to the door. Just in case. I think you'll be addicted to these nachos once you've tried it. This is not a guess, but a fact! Every other nachos I've eaten is compared to this. It's really the benchmark of nachos. You must try their nachos. If you're a light eater, bring a friend! It's not a meal to take lightly -- both figuratively, and literrally. I'd rather eat at Alberto's than El Cholo anyday! You have great taste! Don't forget to find Franko's n the food court @ Michelson between Jamoree and MacArthur. I heard (don't quote me on this) that they are all the same "franchise" but they are avoiding the franchise tax fee so they don't have an official franchise name or association. Thus the myriad of names ending with "ertos"
Me too. Cheap Mexican is always better than Expensive Mexican. The price differential is one thing, but for some reason, even the ingredients are just plain tastier at the hole-in-the-walls. Thanks for the tip on Franco's. I've located it and plan to make a trip there very soon! That's crazy right? Half-order is a frickin' huge! You'll be less impressed with the full-order now though, because, surprise, it's the same as the half-order...except you'll be paying more. I heard a while ago a rumor, which also can't be substiated (as rumors always are), that the Alberto's chain used to be a cohesive operation until there was in-fighting among family members and the whole organization disbanded, into the baby-bertos we see today. Been to Alerto's twice. First visit was to the one on Brookhurst closest to the 405 freeway. The second time to the one farther down on Brookhurst by Banh Mi. I had the half-order of carne asada nachos and a fish burrito. Both were delicious and cheap! The one farther down on Brookhurst apparently servers better quality food according to my parents who have been there many more times than me. I ordered the carne asada fries. I felt as if I was in heaven. Literally....Unfortunately, I am watching my health and have the greatest urge to visit again, but I know I can't. HAHA! Same here with Alertos. First the one closer to the 405, and then now, exclusively, this one, farther up on Brookhurst. This one's a lot cleaner and has better food. And who needs more of a reason than those two! There is also a location on the corner of Harbor and Katella boulevard. It doesn't have a drive-thru but it is always busy which IMO keeps the food quite fresh. 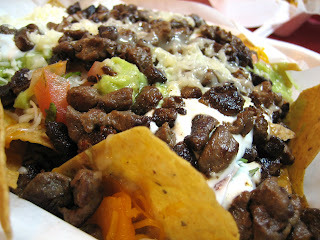 I usually alternate between the half order carne asada nacos (no beans, extra cilantro please!) and an Animal-style Double Double from In-N-Out as my first meal back in Cali.